A way to experiment with machine learning on the road. Everyone from Uber to Waymo is working toward a future when cars will drive themselves, and the technology that could get us there can seem hopelessly complicated. Zümi is a new robotics kit that lets anyone experiment with some of the same tools companies are using to make cars drive themselves. You don't need prior coding experience to experiment with Zümi's AI mapping, machine vision, and self-driving capabilities. You will, however, need to back the Kickstarter. 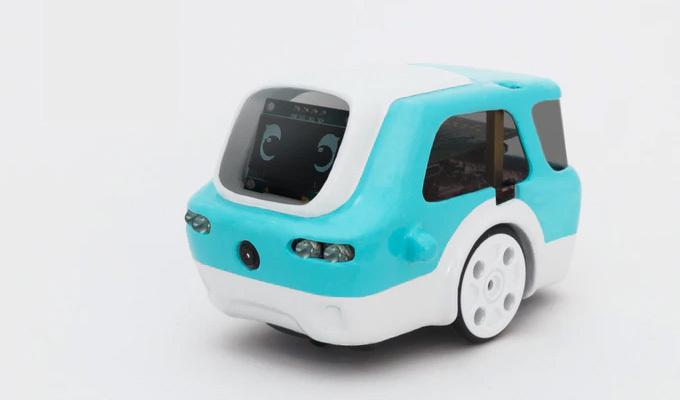 Zümi is a two-wheeled robot with an approachable, enigmatic design from a company called Robolink. The 128 x 64 OLED display in the front "windshield" shows a pair of eyes that emote in response to various activities or conditions. Inside, Zümi runs on the Raspberry Pi Zero with a Pi camera to see the world directly ahead. Playing around with Zümi can give you a grounding in basic robotics, but the AI features are the real stars of the show. Zümi uses TensorFlow and Open CV, both of which are used in real autonomous driving projects. As with all machine learning systems, Zümi needs training data to understand how to perform a task. In just a few minutes, you can help Zümi learn to navigate a model road, identify intersections, and more. The key is teaching it to recognize objects, which could be fallen trees on the model road, hand signals, or anything else. One of the most vexing problems in self-driving car technology is how to make decisions that could injure people. For example, should your car veer off the road and put you in danger to avoid striking a pedestrian? Should it swerve away from a cluster of people, knowing that it will run over someone who otherwise would have been safe? You can teach Zümi to recognize people and experiment with solutions to these problems yourself. Robolink offers two ways to get started programming your robot. The online IDE supports a basic visual block system for building programs, as well as Python scripting. There's also a step-by-step If you're already familiar with the basics of Python and AI programming, you can create your own TensorFlow and Keras code to drive your experiments. The campaign has already raised around $100,000 as of this posting, which is double the initial $50,000 goal. All the early bird deals are gone, so you'll have to drop $139 to get your own Zümi kit. The devices will eventually retail for $180, so you're still saving a little cash. Rewards should ship in June 2019.